Marci: You remind me of somebody in all that fur and jewelry. While reviewing titles, I like to keep a piece of paper and a pen handy to jot down things that I like and dislike about the film. In the case of Marci X, my paper was filled, though not with pros and cons regarding the movie but rather a list of things that might be more enjoyable than sitting through it. They included being burnt alive, falling from a very high building, being attacked by a swarm of bees, and generally any other horrific event my mind could conjure up, you know, like George Bush getting re-elected. Dumped into theaters in late August—when it made about a dollar in domestic box office—Marci X follows Marci Feld (Kudrow), the daughter of rich businessman Ben Feld (Benjamin) who owns a small record label that specializes in hard-core rap. One of the clients is Dr. S (Wayans), a rapper whose song titles include Shoot the Teacher among others, and his lyrics have led to a large boycott of all businesses owned by Feld. Thanks to all of this pressure, Ben suffers a heart attack and ends up in the hospital, leaving Marci in charge of the family business. Things get difficult as Marci must not only tame Dr. S, but also avoid falling in love with him. Aww, so sweet... thinking of it makes me want to vomit. Plain and simple, Marci X is an unparalleled mess, the likes of which have rarely been seen. While the premise is rather promising—that of a rich New Yorker with no understanding of the hip-hop culture attempting to tame a wild rap star—the delivery is horrific and, frankly, rather racist. 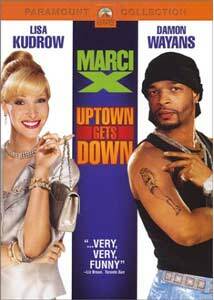 No race or religion is spared as Marci is made out to be a Jewish princess who only knows how to shop and complain, while Dr. S (real name Kelvin) is a street thug with no understanding of the world around him. There are lines in the script that offer a cringe so deep that I am surprised that they were considered to be even an attempt at humor. For example, Marci's question to Dr. S: "When black people make love, is it different?". I found this insulting and as far away from humor as you can get; strangely, no one involved in the production of the film seemed to notice. That said, Marci X does get a very tiny amount of credit for having at least a few lines that are not in bad taste, but rather terrifically dark in humor. I liked the scene involving an auction for children who can't raise their arms, but the film mostly drags on to a painfully unfunny conclusion in which Marci and Dr. S must defend their music in front of Congress. The screenwriter, Paul Rudnick, is a talented man whose previous films have reaped the benefits of his sarcastic humor, but it does not work here. He and director Richard Benjamin take a setup that has potential and handle it in all of the wrong ways. And stuck in the middle of the mess is Lisa Kudrow, perhaps the most gifted member of the cast of TV's Friends in the comic area. But here, without sharp dialogue and an environment in which she can be endearing, she comes off as dull and uninteresting. Kudrow is truly a comedic talent, something that only a few of her ventures onto the big screen have realized. Image Transfer Review: Presented in both an anamorphic widescreen transfer that preserves the original 1.85:1 aspect ratio as well as a slightly cropped full-frame image, Marci X offers a very pleasing picture. Colors are amazingly well done with perfect definition and rendering. Sharpness and detail are good, giving the image a very film-like look. This is a very impressive transfer. Audio Transfer Review: The rather basic Dolby Digital 5.1 mix offers little more than just action in the center channel. Dialogue is crisp and clear throughout, though I noticed a handful of moments where it sounded as though the center speaker was mixed a tad lower than the other channels. Extras Review: The film's theatrical trailer is offered in nonanamorphic widescreen with Dolby Surround. Marci X is a painful and all together horrifying mess of a motion picture. It represents a wasted effort on the part of Kudrow and screenwriter Paul Rudnick, each of whom are capable of much better work.